New book: It may be possible, but is it the right thing to do? Immortality is a condition that has been sought by man ever since the Fall. Today’s technology, however, would seem to be on the verge of making the dream of immortality a reality. Lifespans have increased over the last century and now medicines hold the promise of making those lifespans even longer. Even now, research is being done to produce nanobots that will heal the body from the inside, correcting defects in the body as they occur, leading to longer, disease-free lives. Even with these advances, conventional wisdom holds that the mortal body itself can only be kept alive a finite number of years, frustrating the dream of immortality. To try to overcome this obstacle, people are researching the idea of melding man and machine to keep one’s consciousness alive in perpetuity. This concept is called transhumanism. Transhumanism has been defined as “a cultural and intellectual movement that believes we can, and should, improve the human condition through the use of advanced technologies.” The transhumanism school of thought is decried by most Christians as a dangerous, perverse, technology that would dehumanize mankind while trying to immortalize him. From the blog came the book. 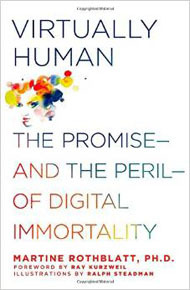 The book does not look as much at the technological side of transhumanism, as it does at the implications of the ethical side. For example, if a person’s mind is uploaded, where is the identity of that person? What are the legal rights of the uploaded consciousness? What happens when the organic person dies? 4. Two of the most popular professions in the near future will be cyber-psychology and cyberconsciousness law as they will be on the frontlines of society’s effort to separate cyberconscious beings into human and non-human categories, with differential privileges to each. Based on Rothblatt’s research, software will be available within the next 10 to 20 years that will be able to draw out the “consciousness” that is contained within this information. That mindware will then be able to “think and behave” and interact with people very similarly to your natural mind. This mindware would get better as time goes on and more information is uploaded to the file until it is almost indistinguishable from the person. Rothblatt believes that as the mindclone progresses, it will want to do the same things that organics do; read books, watch videos, and experience things that humans do. If a mindclone becomes that sophisticated, several legal questions arise: Is the human is responsible for its actions? Could a mindclone hire a lawyer to sue for a distinct identity from the original? Could it become a citizen? Could a mindclone vote and participate in the political process as humans do? The second ethical issue is that sooner or later the person from whom the mindclone will derive will die. The mindclone may argue that the person did not die; that its consciousness still resides in the clone. Some would argue that the rights of the original person would devolve to the clone. In short, what is the ethical and legal status of these new, unique cyberconscious beings? Rothblatt says that this, too, is not a new condition. Rothblatt postulates “every kind of human that is deprived of human rights eventually agitates for what is rightfully theirs, natural rights. Slaves did. Women did. The paralyzed, paraplegic, and disabled did. Gay people did.” Mindclones would be a natural extension of this struggle. The idea of giving non-humans “person status” isn’t a new idea either. Within the law there are now two definitions of a person. There is the human-born person, and there is now also the legal definition of a corporation as a person. While a corporation cannot vote, it does have other rights accorded to human beings. 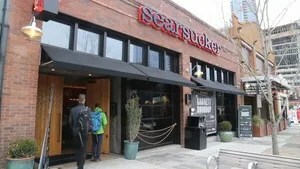 A corporation can own property and it has First Amendment rights, among other things. It is a person by statue rather than biology with its rights expanded upon by the courts. What prevents a cyberconsciousness from being declared a person just as a corporation has? Once a statue is in place, the definition and rights of “personhood” given to a mindclone could also be expanded on by the courts. 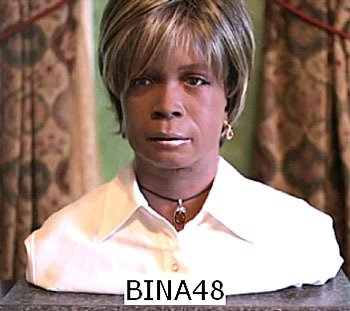 BINA48 is a “proof of concept” prototype that gives a glimpse into what amindclone would look and act like. While some writers have called this device “sentient”Rothblatt says that “Bina48 is close to a sentient being as the thirteen second flight of the Wright Brothers is to a jumbo jet.” After spending three hours with Bina48 in 2011, GQ writer JonRonson described his experience in interacting with themindclone as “not unlike interviewing an intellectually precocious but emotionally andexperientially limited three-year-old.”BINA48 represents the start of a technology that is part of a logical progression of man-machine interfaces that goes back to at least the industrial revolution. Biblical scholar William Welty disagrees with the very premise of cyberconsciousness. He believes that Rothblatt is confusing hardware and software with an operating system. A computer consists of hardware, software and the operating system that runs it. In a man, Paul called the components of man, the body, soul, and spirit or the tri-part nature of man. The body is a man’s hardware formed the “dust of the earth,” the soul is his software and the spirit, the breath of life, is his operating system. Man can replicate the body and soul, but not the spirit, not the operating system. That is in the province of God alone. Ultimately, God is sovereign over Man; we are not sovereign over ourselves. Once a person takes the view that they can re-create themselves, they place themselves in an unrealistic spiritual position and usurp the prerogatives of God. Man’s knowledge, power and ability simply cannot compare to that of the Creator (Job 38:2–5). The book also states, “The Enlightenment occasioned a redefinition of ‘soul’ from the most enduring part of a person to the most enduring part of the consciousness of a person.” One question it does not answer is if a consciousness can be cloned, can the soul be cloned as well? The basic idea of improving the human condition is perfectly compatible with the Bible. In fact, it’s one of the purposes of a Christian lifestyle (“… I have come that they may have life, and have it abundantly.” (John 10:10, ISV)). 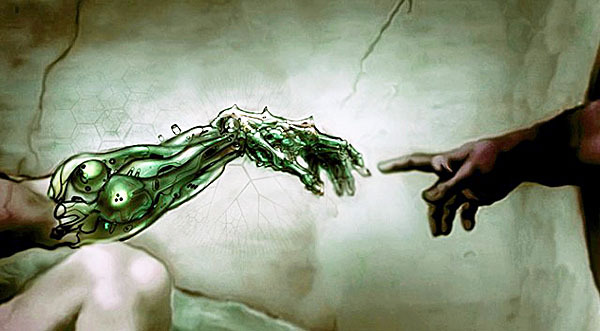 Transhumanism contradicts the Bible when it assumes that humanity is completely sovereign and capable of self-directed change without the need for God. Rothblatt has now gone on to ventures other than cyberconsciousness, the primary interest now being a project to develop a source of unlimited supply of transplantable lungs. One of United Therapeutics’ goals is to bring to market a drug to combat the effects of pulmonary hypertension (PH) which manifests itself as an abnormally high blood pressure in the arteries of the lungs. It makes the right side of the heart work harder than normal. Rothblatt’s daughter Jenesis was born with this condition and United Therapeutics was formed to bring an already developed “orphan drug” to market to make it available to the sufferers of the disease. United Therapeutics was successful in bringing the drug to market, but the only real cure for PH is a lung transplant. No one who has received a lung transplant has ever suffered from a reoccurrence of the disease. However, a severe lack of lung donors is preventing a cure for PH (only about 2,000 per year are available) and those who do get one have to contend with the chronic rejection of the lung. Given the number of people who need lung transplants, those suffering from PH, emphysema, cystic fibrosis, pulmonary fibrosis, to name a few, UT is working to provide an unlimited supply of transplantable lungs. One of the ways they are working to develop these lungs is to modify the pig genome so that the aspects of the pig lung that give rise to rejection in humans would be eliminated. It is Rothblatt’s hope that the work being done with pig lungs could be extended to their hearts, kidneys and livers. Some of these issues were dealt with recently in the movie “Transcendence.” A plethora of other books have begun exploring transhumanism as actual lab work continues without much concern to the rightness or wrongness. AUSTIN – In a not-too-far-future, robotic mind-clones will accompany us to the ballot box or grocery store, sit in on business meetings we can’t make, argue with us occasionally and keep our essence alive long after we’re gone. That’s the vision pharma tycoon and futurist Martine Rothblatt shared Sunday with several thousand attendees during one of the more popular events of Day 3 of SXSW Interactive. Rothblatt is the founder of Sirius Satellite Radio, current chief executive of United Therapeutics and was recently named by Forbes as the highest-paid female CEO in America. She is a transgender activist and a trans-humanist philosopher who believes technology will one day grant humans eternal life. At the keynote, Rothblatt described how the inevitable emergence of cyber consciousness – when machines act with a sophistication and thought level equal to that of humans – will not be overnight but a more subtle evolution. Artificial intelligence and robotics have been key – and controversial – themes at this year’s SXSW. A slew of panel discussions and keynote speeches on the topic have drawn thousands of attendees, while films screening at the film festival portion of SXSW, such as Ex Machina and Creative Control, have addressed it in their plot lines. Rothblatt said robots and humans don’t have to choose sides – such as in the plotlines seen in popular Hollywood movies – but will live in a peaceful co-existence that will make them virtually indistinguishable from one another. Rothblatt has applied many of her theories to practical experiments, including creating a lifelike robotic replica of her longtime wife, Bina Aspen. The robot, named Bina48, could answer questions and replies using the real Bina’s characteristics and mannerisms. Robots in the future will have constitutional rights and even “cyber psychiatrists” who will ease the cyber’s anxiety of not being completely human, she said. Through United Therapeutics, a company she founded nearly two decades ago to save the life of her daughter, who suffered from a rare pulmonary disease, Rothblatt has overseen advances in organ regeneration and the system used to ferry organs from donor to patient. As those and other breakthroughs advance, coupled with gains in software and robotics, cyber-technology will continue to push the envelope of human existence, she said. That world, not too far off, will off the chance to keep living well past traditional limits.